I started reading comics as a kid in Austin, Texas. There was a Half Priced Books next to the orthodontist office that I went to, and afterwards I got to go in and pick out something. They had all these non-consecutive comic book issues. It was very, very exciting, because you’d have a bunch of Part 2 of 4, but none of the other parts, so it felt like there was this huge narrative world that I was only getting a tiny little peek into. I just loved it. Couldn’t get enough of it. 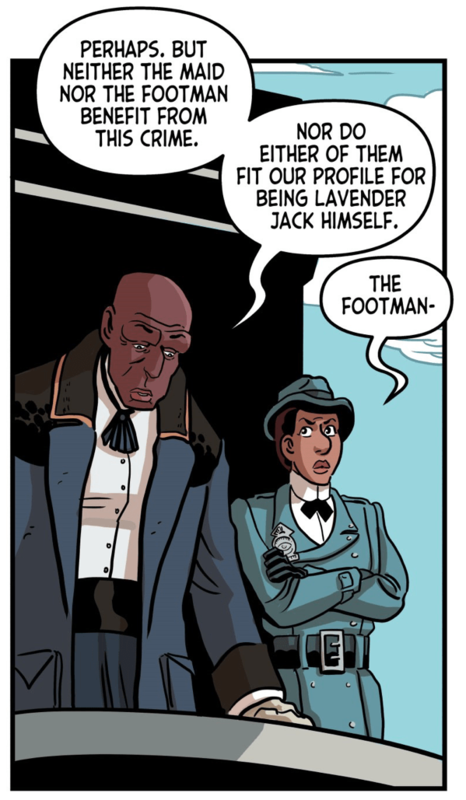 How do you describe Lavender Jack? Lavender Jack is like if P.G. Wodehouse wrote a season of Arrow. Right before we launched it I showed it to my friend Brandon Seifert and he said, ‘Oh, it’s like if you hired Sherlock Holmes to catch Batman.’ I’m like, ‘Okay, that works, too.’ Whenever I’m talking to somebody, I try to figure out how likely they are to know who P.G. Wodehouse is and then I modulate the pitch accordingly. 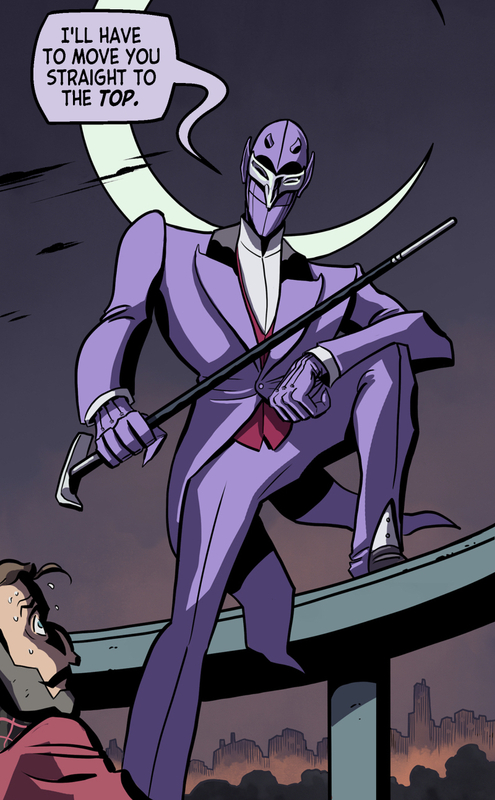 Lavender Jack is exposing the crimes of the wealthy elite. How did you come up with this crazy idea of wealthy people committing horrible, corrupt crimes and then covering them up? What can I say, I’m a creator of fantasy. [laughs] Honestly, I love costume dramas. I love historical BBC style intrigue. I thought it would be really cool if you injected a more contemporary superhero element into that. That made me think, Don Diego de la Vega or Bruce Wayne or Oliver Queen always put on this front of being effete upper class dilettantes, these drunk wastrels when secretly they’re super vigilantes. 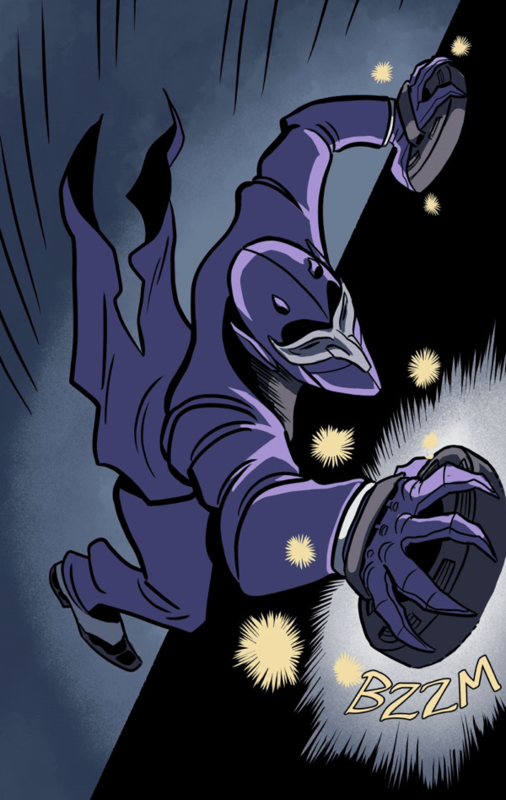 I thought it would be fun if the vigilante character was Bertie Wooster. The combination of those things but still keeping the levity and fanciness and the soft touch of stuff from that period seemed like they would be really cool to play off each other. 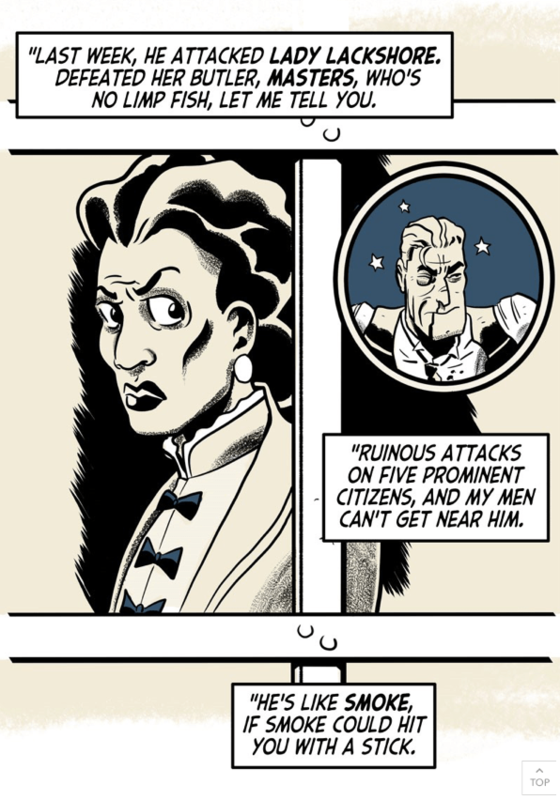 I subscribe to the theory that the first superhero in fiction is The Scarlet Pimpernel, created by Baroness Orczy, who was an Anglophile. She was a Hungarian noblewoman who moved to England and became enchanted by the high society and the balls and the gowns and things like that, yet she chose to make it an action adventure tale with swordfighting. This is progressing that mold. The story takes place in “Nineteen hundred something or other.” I kept thinking of work like the Jeeves and Wooster series with Hugh Laurie and Stephen Fry, which was set in a vague period but they were saying, don’t worry about the details or the anachronisms. Yes. I love that series by the way. It makes you think that whoever is telling the story of what happened here was so blitzed that they don’t remember the exact year. And the only people who were sober were the butlers and housemaids and they’re too polite to correct you. Or the person writing asked the servants and went, the servants couldn’t be right. Exactly! Also there’s a lot of anachronistic elements to Lavender Jack. I thought it was a good idea to right out of the gate say, don’t worry too much about our world’s history in relation to this. Theresa Ferrier, the detective, is a Holmes-like figure and she’s older and dealing with a very new period and it is about this crash of periods and sensibilities in many ways. That was something I thought would be really fun as well. To take a very conventional protagonist for the period – the Hercule Poirot/Sherlock Holmes-type detective – and play them off against this superhero character. It looked good in my head and I knew it would look good on the page. You can see it in the way that I’ve designed Theresa Ferrier and Lavender Jack. Jack is very spritely and erect and his shoulders slope upwards and he’s very theatrical, whereas Theresa Ferrier’s shoulders are very slumped, she’s older, she’s tired. That’s before we get into things like their ages, their genders. I wanted it to be that when you finally see them in the same room there’s this electric contrast between them. Say a little about Theresa Ferrier and who she is. Of the characters I’ve come up with so far in my career, I think she might be my favorite. She is somebody who is at the end of her career, she is nearing the end of her life, and she’s nearing the end of her relevance. Her partner, Marguerite, has a condition and we’ll find out its very serious. I liked the idea of playing this older style of protagonist against this newer style, so I wanted everything about her to be falling apart, for her to be disenchanted. At the same time I still want her to be an engaging exciting mystery protagonist. Yeah, she’s tired, but she has this great faculty to do those fun detective tricks that we like. She knows a little martial arts. The hope is that we have somebody who is in the last chapter of her life, but who can still surprise us. And maybe she can find some energy she’s lost. Four chapters in, I feel like she doesn’t like anyone she’s met. Yes, she’s just too polite to say so. That’s definitely where she’s at at the beginning of the series. That’s an interesting thing to write because it means she gets to comment on everything as she goes through the series. When you’re older and you don’t really feel like you have a dog in the race anymore, you stop caring about what people think about your opinions. Inspector Crabb, who she’s partnered with, is very energetic and by the book. You have a lot of room to have them both of them bounce off each other when confronted with a situation or a character and look at it from two very different perspectives. I’m curious how readers will respond to Crabb because she’s not necessarily what people expect of the police character in some ways. I’m interested to see how that develops as well. Each episode of Lavender Jack gets hundreds of comments and I have friends who are helping me sift through them because I’m still getting used to such immediate response from readers. You just don’t get that when you’re working in print comics. You get some reviews and maybe some talk on twitter but not hundreds of comments in the first day. 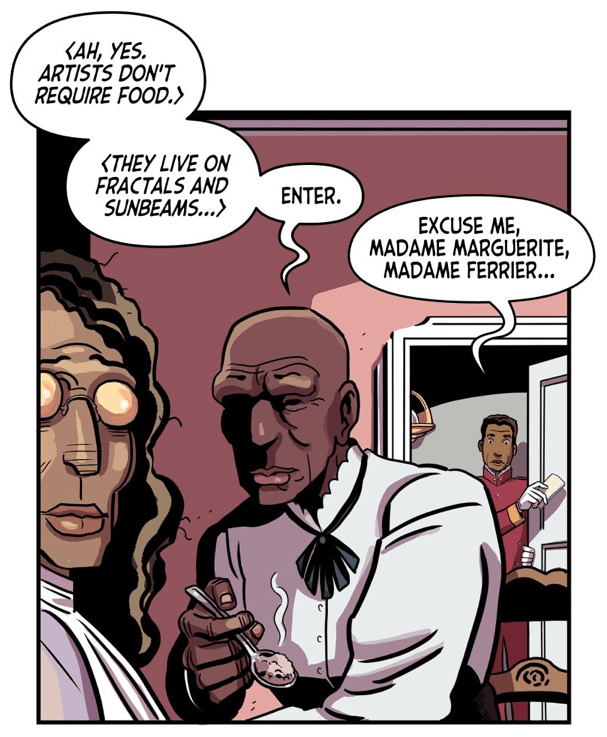 A lot of people are picking up on the idea that Ferrier owes a little more to Hercule Poirot than Sherlock Holmes and that’s cool. I think it helps that a movie just came out. I had her speaking some French and that’s a cue for people to look for a different kind of character. So far from what I’ve seen they’re excited by the idea of a mystery with these types of characters. I think it feels a little bit new. Especially to the younger readership. 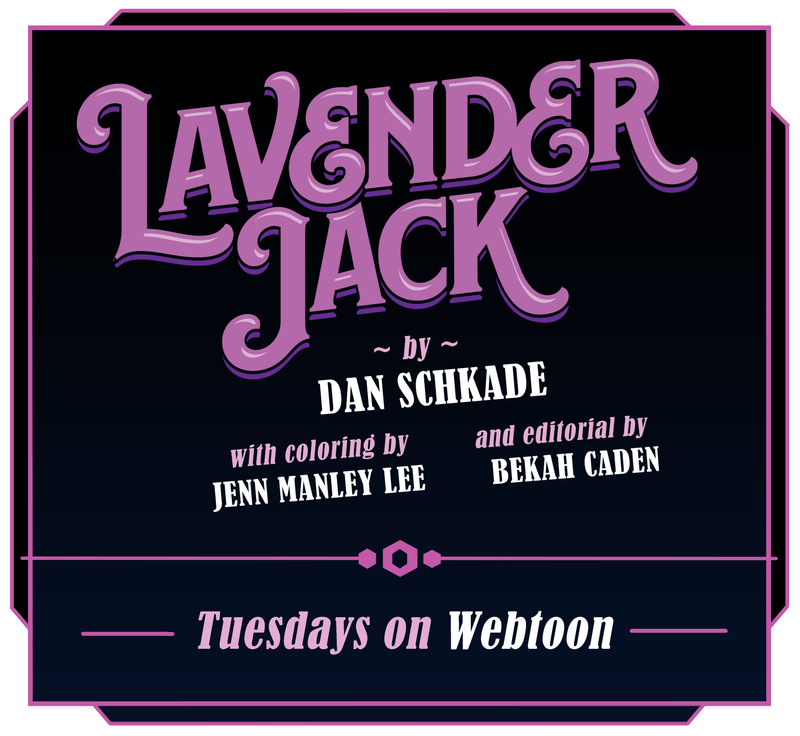 Lavender Jack feels familiar, but there aren’t many comics like this. I think that’s a cool thing to shoot for as a creator. To create something that feels familiar but has a freshness to it. I don’t have any illusions of being a great writer. I’m not shooting for something portentous and literary, I’m trying to write a really good piece of genre fiction. Or the best piece of genre fiction I can write. I think a lot of that is meeting 60% and subverting 40% of audience expectations. If you veer too far one way the audience loses the thread and if you veer too far the other way, they’re bored. Which is worse than being bad. How did you end up with Line Webtoon? I got pretty lucky. Webtoon started in South Korea and decided to expand in a serious way into the West, so they opened offices in Los Angeles and hired American editors. One of their editors knew me, and knew I was working on an earlier version of Lavender Jack, so she solicited a pitch from me. I spent a number of months developing it. My editor, Bekah Caden, is a wonderful story editor and really helped me hone in on what the series is about, thematically. And of course, helping me transition from print comics to the slightly different format of Webtoon. 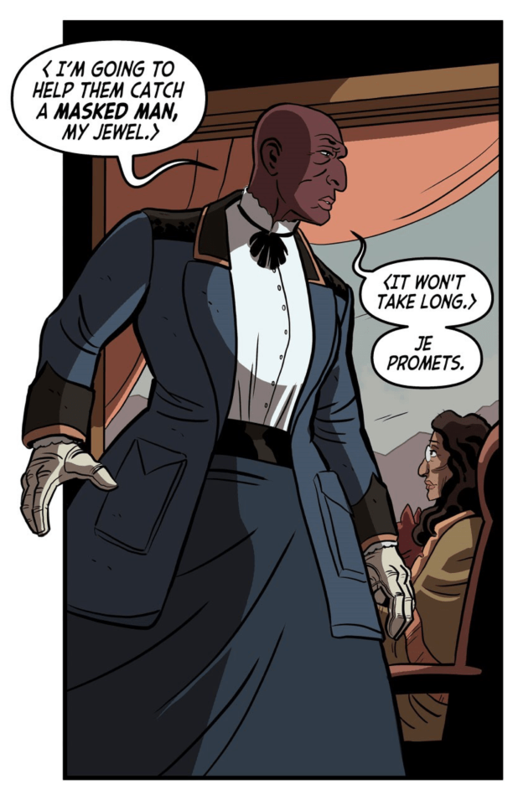 Little things you wouldn’t think of, like how the lettering has to work and a different way to compose panels. So far I’m really happy with the results. I was going to ask how you’re drawing it because Webtoon has such a specific format. Are you thinking about how it will look on a printed page and then adapting it or are you just thinking in terms of the scroll? I’m thinking in terms of the scroll and not thinking about how it’s going to be printed. When I started Lavender Jack I was unfamiliar with this format and I didn’t want to compromise my ability to learn by trying to do two things at once. If it gets popular enough to warrant a print edition, or in a couple years when the rights revert to me and I chose to do a print version myself, we’ll be able to figure it out. That’s a good problem and I have confidence in the ingenuity of future me and whoever future me has around him. The most important thing for me is that it reads well on Webtoon. There are little reveals. For instance there’s a panel in episode two where’s this big statue of Mercury that we’ve been seeing in a couple of panels, and you’re scrolling down this big picture of the statue, and you realize that someone has been watching what’s been happening in the scene from behind the statue. I’m concerned with nailing little things like that rather than worrying about how they’re going to replicate on the page.